In our last post, we saw the use of shotguns in geological engineering. In this post, we will look at some more unusual uses of shotguns, in the fields of industry. In industries like steel and cement, when a lime kiln or a blast furnace is used, there is always a gradual build up of material impurities, such as limestone clinker and excess cement (in the case of a lime kiln) or slag deposits (in the case of a blast furnace). These impurities harden on the inside and form rings, which reduce the efficiency of the kiln or blast furnace. Hence, a worker must periodically go in there and loosen the materials so that they can be removed. The same problem occurs in silos, mines and quarries for pretty much the same reasons. In the early days, people would shutdown the kiln or furnace and wait for it to cool down. 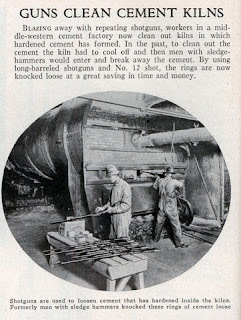 Then they would get inside with large sledgehammers and try to break the deposits manually. Then someone had the bright idea of using a large gauge shotgun to blaze away at the deposits and break them. This meant that they wouldn't have to wait for the kiln to cool down. The image below is a description of the process as it appeared in an issue of Popular Science in February 1933. 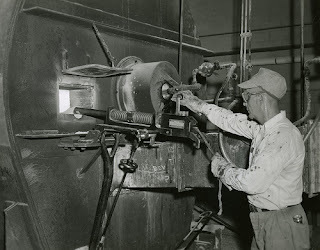 The guns used in this process are usually 8-gauge or larger. They are mounted on a stand so that the user doesn't have to bear the recoil forces. 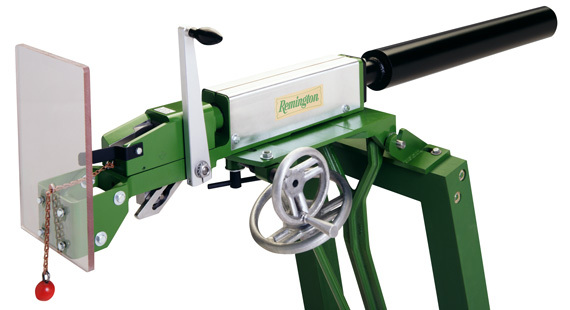 Winchester and Remington are two major manufacturers of kiln guns. Remington's system is called "Masterblaster" and is usually painted green, while Winchester calls their tools "Western" and "Ringblaster" and usually paint them red. Remington Masterblaster system. Click on image to enlarge. Note the control wheels and levers that allow the user to point the shotgun in the designated direction and shoot it. Using such a system allows the manufacturer to speed up the cleaning process and reduce equipment downtime. 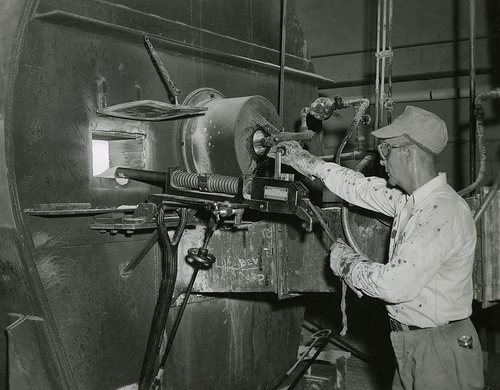 As you can see, kiln guns are pretty handy tools to have in industrial environments.